ROCKFORD — In 2005, Bob Moreland was looking for a good hangar to house his prize plane, a 1956 Cessna 180. That led he and his son, Zachary Moreland, a senior architect at Shigeru Ban Architects America, to develop what he describes as “the perfect hangar.” Moreland’s solar-heated hangars maintain a minimum of 50 degrees with a negligible use of fossil fuel. 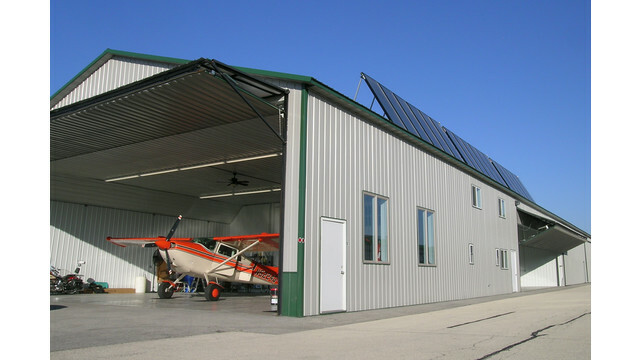 The third and most recent hangar his company built, which features more solar collectors than the previous two, achieves a minimum of 55 degrees on the coldest days without the need for a boiler system. Moreland found he wasn’t the only one in the market for energy-efficient aircraft storage. His goal for one private hangar at Chicago Rockford International Airport grew into a business, which now has 30 individual units in three buildings totaling nearly 40,000 square feet.